Our ovenable wrap allows you to cook, store and serve hot wraps in the same packaging! 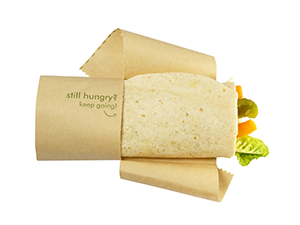 Pop in your uncooked wrap, fold it up snug, heat it up to 220°C, keep it in the hot cabinet and then serve! To eat simply tear along the dotted line to enjoy your hot treats without dripping melted cheese down your elbows!